I recently noticed that Sarah Sharp resigned publicly from the kernel giving a failure to impose a mandatory code of conduct as the reason and citing interaction problems, mainly on the mailing lists. The net result of this posting, as all these comments demonstrate, is to imply directly that nothing has ever changed. This implication is incredibly annoying, firstly because it is actually untrue, secondly because it does more to discourage participation than the behaviour that is being complained about and finally because it totally disrespects and ignores the efforts of hundreds of people who, over the last decade or so, have been striving to improve all interactions around Linux … a rather nice irony given that “respect” is listed as one of the issues for the resignation. I’d just like to remind everyone of the history of these efforts and what the record shows they’ve achieved. The issue of respect on the Mailing lists goes way back to the beginnings of Linux itself, but after the foundation of the OSDL (precursor to the Linux Foundation) Technical Advisory Board (TAB), one of its first issues from OSDL member companies was the imbalance between Asian and European/American contributions to the kernel. The problems were partly to do with Management culture and partly because the lack of respect on the various mailing lists was directly counter to the culture of respect in a lot of Asian countries and disproportionately discouraged contributions from that region. The TAB largely works behind the scenes, but some aspects of the effort filtered into the public domain as can be seen with a session on developer relations at the 2007 kernel summit (and, in fact, at a lot of other kernel summits since then). Progress was gradual, and influenced by a large number of people, but the climate did improve. I have to confess that I don’t follow LKML (not because of the flame war issues, simply because it’s too much of a firehose); however, the lists I do participate in (linux-scsi, linux-ide, linux-mm, linux-fsdevel, linux-efi, linux-arch, linux-parisc) haven’t seen any flagrantly disrespectful and personally insulting posts for several years now. Indeed, when an individual came along who could almost have been flame bait for this with serial efforts to get incorrect and badly thought out patches into the kernel (I won’t give cites here to avoid stigmatising individuals) they met with a large reserve of patience and respectful and helpful advice before finally being banned from the lists for being incorrigible … no insults or flames at all. Although I’d love to take credit for some of this, I’ve got to say that I think the biggest influencer towards civility is actually the “professionalisation” of Linux: Employers pay people to work on Linux but the statements of those people become identified with their employers (no matter how many disclaimers they have) … in many ways, Open Source engineers are the new corporate spokespeople. All employers bear this in mind when they hire and they certainly look over the mailing lists to see how people behave. The net result is really that the only people who can afford to be rude or abusive are those who don’t think they have much chance of a long term career in Linux. So, by and large, I’m proud of the achievements we’ve made in civility and the way we have improved over the years. Are we perfect? by no means (but then perfection in such a large community isn’t a realistic goal). However, we have passed our stress test: that an individual with bad patches to several mailing lists was met with courtesy and helpful advice, in spite of serially repeating the behaviour. This entry was posted in Linux on 8 October 2015 by jejb. As a few people have noticed, I’m a bit of an internet control freak: In an age of central “cloud based” services, I run pretty much my own everything (blog, mail server, DNS, OpenID, web page etc.). That doesn’t make me anti-cloud; I just believe in federation instead of centralisation. In particular, I believe in owning my own content and obeying my own rules rather than those of $BIGCLOUDPROVIDER. In the modern world, this is perfectly possible: I rent a co-lo site and I have a DNS delegation so I can run and tune my own services how I wish. I need a secure web server for a few things (OpenID, an email portal, secure log in for my blog etc) but I’ve always used a self-signed certificate. Why? well having to buy one from a self appointed X.509 root of trust always really annoyed me. Firstly because they do very little for the money; secondly because it means effectively giving my security to some self appointed entity; and thirdly, as all the compromises and misuse attests, the X.509 root of trust model is fundamentally broken. In the ordinary course of events, none of this would affect me. However, recently, curl, which is used as the basis of most OpenID implementations took to verifying X.509 certificate chains, meaning that OpenID simply stopped working for ID providers with self signed certificates and at a stroke I was locked out of quite a few internet sites. The only solution is to give up on OpenID or swallow pride and get a chained X.509 certificate. Fortunately startssl will issue free certificates and the Linux Foundation is also getting into the game, so the first objection is overcome but not the other two. So, what’s the answer? As a supporter of cloud federation, I really like the monkeysphere approach which links ssl certificate verification directly to the user’s personal pgp web of trust. Unfortunately, that also means that monkeysphere suffers from all the usual web of trust problems, the biggest being that it’s pretty much inaccessible to non-techies who just don’t understand why they should invest time in building up their own trust contacts. That’s not to say that the web of trust can’t be made accessible in a simple fashion to everyone and indeed google is working on a project along these lines; however, today the reality is that today it isn’t. Enter DANE. At is most basic, DANE is a protocol that links certificate verification to the DNS. It means that because anyone who owns a domain must have a DNS entry somewhere and the ability to modify it, they can directly link their certificate verification to this ability. To my mind, this represents a nice compromise between making the system simple for end users and the full federation of the web of trust. The implementation of DANE relies on DNSSEC (which is a royal pain to set up and get right, but I’ll do another blog post about that). This means that effectively DANE has the same operational model as X.509, because DNSSEC is a hierarchically rooted trust model. It also means that the delegation record to your domain is managed by your registrar and could be compromised if your registrar is. However, as long as you trust the DNSSEC root and your registrar, the ability to generate trusted certificates for your domain is delegated to you. So how is this different from X509? Surely abusive registrars could cause similar problems as abusive or negligent X.509 roots? That’s true, but an abusive registrar can only affect their own domain and delegates, they can’t compromise everyone else (unlike X.509), so to give an example of recent origin: the Chinese registrar could falsify the .cn domain, but wouldn’t be able to issue false certificates for the .com one. The other reason for hope is that DNSSEC is at the root of the scheme to protect the DNS infrastructure itself from attack. This makes the functioning and administration of DNSSEC a critical task for ICANN itself, so it’s a fair bet to assume that any abuse by a registrar won’t just result in a light slap on the wrist and a vague threat to delist their certificate in some browsers, but will have ICANN threatening to revoke their accreditation and with it, their entire business model as a domain registrar. In many ways, the foregoing directly links the business model of the registrars to making DNSSEC work correctly for you. In theory, the same is true of the X.509 CA roots of trust, of course, but there’s no one sitting at the top making sure they behave (and the fabric of the internet isn’t dependent on securing this behaviour, even if there were). Mode 0 – X.509 CA pinning: The TLSA record identifies the exact CA the TLS Certificate must chain to. This certificate must also be a trusted root in the X.509 certificate database. Mode 2 – Trust Anchor Assertion: The TLSA record specifies the certificate to which the TLS Certificate must chain to under standard X.509 validation, but this certificate is not expected to be an X.509 root of trust. Mode 3 – Domain Issued Certificates: The TLSA record specifies exactly the TLS certificate which the service must use. This allows domains securely to specify verifiable self signed certificates. Mode 3 is most commonly used to specify an exact certificate outside of the X.509 chain. Mode 2 can be useful, but the site must have access to an external certificate store (using the DNS CERT records) or the TLSA record must specify the full certificate for it to work. This is the big problem: For certificates distributed via DANE to be useful, there must be support for them in browsers. For Mozilla, there is the DANE validator extension but in spite of several attempts, nothing actually built into the browser certificate verifier itself. The most complete patch set is from the DNSSEC people and there’s also a Mozilla inspired one about how they will add it one day but right at the moment it isn’t a priority. The Chromium browser has had a similar attitude. The conspiracy theorists are quick to point out that this is because the browser companies derive considerable revenue from the CA system, which is in itself a multi-billion dollar industry and thus there’s active lobbying against anything that would dilute the power, and hence perceived value, of the CA roots. There is some evidence for this position in that Google recognises that certificate pinning, which DANE supports, can protect against recent fake google certificate attacks, but, while supporting DNSSEC (at least for validation, the google DNS doesn’t secure itself via DNSSEC), they steadfastly ignore DANE certificate pinning and instead have a private arrangement with Mozilla. I learned long ago: never to ascribe to malice (or conspiracy) what can be easily explained by incompetence (or political problems). In this case, the world was split long ago into using openssl for security (in spite of the problematic licence) or using nss (the Netscape Security Services). Mozilla, of course, uses the latter but every implementation of DANE for mozilla (including the patches in the bugzilla) use openssl. I actually have an experimental build of mozilla with DANE, but incorporating the two separate SSL systems is a real pain. I think it’s safe to say that until someone comes up with a nss based DANE verifier, the DANE patches for mozilla still aren’t yet up to the starting blocks, and thus conspiracy allegations are somewhat premature. Unfortunately, the same explanation applies to chromium: for better or worse, it’s currently using nss for certificate validation as well. This entry was posted in Linux on 30 May 2015 by jejb. Much has been written about Mozilla trying to force people to use their new sync service. If, like me, you run your own sync server for Firefox, you’ve mostly been ignoring this because there’s still no real way of running your own sync server for the new service (and if you simply keep upgrading, Firefox keeps working with your old server). However, recently I had cause to want to connect my old sync server to a new installation of firefox without just copying over all the config files (one of the config settings broke google docs and I couldn’t figure out which one it was, so I figured I’d just blow the entire config away and restore from sync). 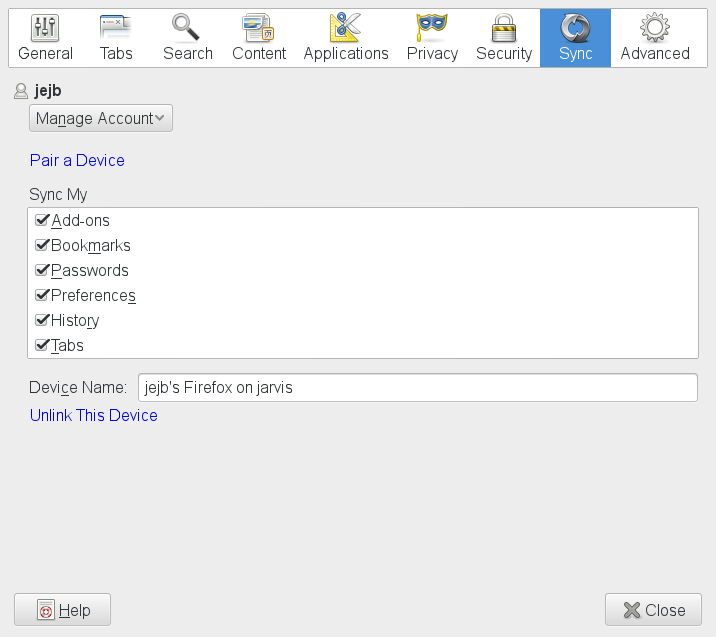 Long ago Mozilla disabled the ability to connect newer Firefoxes to an old sync server, so this is an exposé of how to do it. I did actually search the internet for this one, but no-one else seems to have figured it out (or if they have, they’re not known to the search engines). And that’s it. You’re all done. This entry was posted in Linux on 23 April 2015 by jejb. Which is very helpful. Everything else works with imaps on this system, so why not squirrelmail? So that’s it: php has tightened up the certificate verification not only to validate the certificate itself, but also to check that the CN matches the requested service. In this case, because I’m connecting over the loopback device (localhost) instead of the internet to the DNS name, that CN check has failed and lead to the results I’m seeing. Simply fixing squirrelmail to connect to imaps over the fully qualified hostname instead of localhost gets everything working again. This entry was posted in Linux on 18 April 2015 by jejb. Printing and scanning has always been the bane of Linux. I thought I solved it three years ago by getting a nice network printer (HP OfficeJet Pro 8600) which spoke postscript and could scan to folder (provided you have samba installed). Unfortunately, this is an inkjet printer and about three months ago the initial cartridges (which are deliberately lightly loaded) ran out of ink. Purchasing new ones (it’s colour so I need four) turned out to be an arm and a leg (or 2x what the printer cost to buy in the first place). Three months after replacement, the whole thing died with a call HP technicians error. This turns out mostly to mean my ink cartridges are leaking. Sure enough the entire inside is awash with a substance more costly than liquid gold … plus it’s now all over my shirt and trousers. Trying to clean it out just gets ink all over the desk and some important papers. Of course, since it’s a UK purchased printer and I’m now living in the US, HP support “cannot help”. Vowing never to purchase another @! **#@ inkjet printer as long as I live, it’s time to find a cheap multi-function laser (did I mention the scanner function on the HP won’t work either now because when it gets this error it locks every function). Investigating lasers, the cheapest multi-function seems to be a Ricoh Aficio SP204 N (the N means netowrk connected, which is nice) for US$60, which is a bargain, plus it’s a laser. Google confirms it can scan to pdf (via file share or email), the only drawback is that the printer engine is “windows only” (one of those direct render on the system and send to printer ones). Further googling around for the printer and linux drivers (and even DDST, the Ricoh name for their direct rendering protocol on linux) yields nothing. Looks like I’ll be writing a driver when it arrives. Fortunately, there is a way of running it (using KVM instead of VirtualBox) providing you have a windows virtual machine, so that’s the initial plan. The only other annoyance is it doesn’t do duplex (either for scanning or printing). Bummer, but you can’t have everything for US$60. When the printer arrives, it turns out it has a web interface (yay) but you can’t program scan destinations with it (and without scan destinations, it won’t scan) … bummer. Install the windows virtual machine with the Ricoh driver and use the tool to program scan to email; amazingly enough it all works correctly (it even scans in colour). Followed the redirection directions with ghostview, ghostscript and redmon and successfully attach the printer to Linux. So it all seems relatively straightforwards: each page is rendered as a pixel map in the jbig compressed image format (it’s lossless, like gif) and the header describes exactly the size and dimensions of the image. So getting it working seems to be very straightforward: just generate the jbig images and slap on the header and footer. Ghostscript doesn’t render natively to jbig, but it will render to ppm and the jbigkit renders what I need. The image dimensions can be obtained from the ppm with the ImageMagick identify command. The only fly in the ointment is the DOTCOUNT. This shows per page how many black pixels are printed and must be something to do with the way the printer tracks the cartridge use; however, it can be faked for the moment. To add insult to injury, the READMEs mention terms I’ve been searching for for ages (like Ricoh and DDST) and the driver filter even has them in the file name … honestly, for being allegedly the primary search engine of the internet, you’d sometimes wonder if google could find its own arse with both hands. So, download this and install it and, yay, it works. Looks like the only real difference between the SP 100 and the SP 204 is that the latter has a higher resolution mode (1200×600) and also can be adjusted to use a bypass tray (which is set in the header too). I’ve done an initial package here and will be updating for the SP 204 additional features. This entry was posted in Linux on 23 July 2014 by jejb.